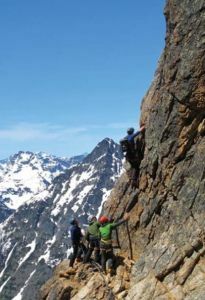 Washington Pass is Northwest Alpine rock climbing paradise. The routes are generally long, moderate, and only an hour or two from the car. It has the convenience of Tuolumne Meadows but more dramatic summits and long climbs in the 5.6-5.9 range. The rock quality is some of the best in the state. Below are some of the best routes and are all included in the SuperTopo guidebook.